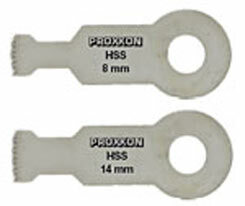 All Products > "28898 Proxxon HSS 14mm Saw Blades 28898"
For exact square cutting and other forms. For making hatchways and windows in ship and aircraft models. Cuts wood, plywood, plastics and aluminium. Max. cutting depth 16mm. Saw blade width 14mm.